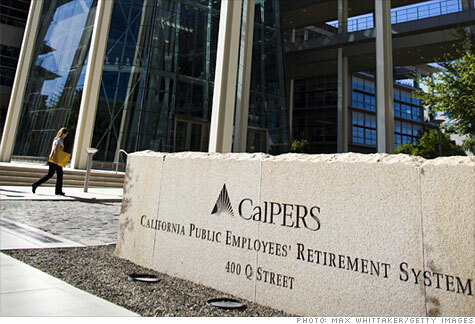 Before clocking a $100 billion loss in early 2009, the California Public Employees' Retirement System, known as Calpers, had the swagger of a hedge fund and the certainty of a saint. Other pension funds followed its lead, loading up on leverage, investing in unrated CDOs, shoving money into high-priced private equity deals and barreling into commodities and real estate. The question now is whether a loss of nearly 40% of its market value -- the worst loss in the system's 77-year history -- has brought Calpers sufficiently back down to earth to avoid another such debacle, and whether other chastened pension systems have followed suit. In truth, not all of the evidence of a rebirth at Calpers is comforting. And in the case of some other underfunded pension funds, their latest financial bets look downright scary. "Some pension plans are evidently hoping to make up losses by taking more risk," says Olivia Mitchell, executive director of The Pension Research Council at the University of Pennsylvania's Wharton School, whose research has shown many pension funds to be poor asset pickers. But, "pension plans that take a risky position to try to 'earn their way out of underfunding' are quite likely to bear big downside risk when the market tanks." This is not to say that Calpers, the nation's largest pension fund, hasn't made some strides in the right direction. Facing billions in unfunded liabilities and increasing anger from California taxpayers who are ultimately stuck with the bill, it would be tempting for Calpers to double down. But Clark McKinley, a Calpers spokesman, says the pension system "took some bitter medicine" and has learned important lessons from the recent financial crisis. Calpers is preparing a new asset allocation strategy after finding that its diversification efforts failed to cushion much of the stock market's fall. Calpers is also reining in its exposure to equity derivatives, moving to reduce leverage in its real estate portfolio, terminating under-performing partnerships, tightening the review process for real estate investments and bringing together its diverse investment groups to poll their knowledge about investment risks and opportunities. Before, McKinley says, information tended to be stove-piped, meaning the retirement system's fixed income department was selling off mortgages even as the real estate department was shoveling money into the sector. Most of Calpers investment losses came from its largely passive investments in baskets of equities, which still account for about half of the system's assets. But the retirement system also got into trouble by adding leverage, reducing oversight and by chasing other hot markets. After maintaining a low-risk real estate strategy for decades, studies commissioned by Calpers show that it switched gears in 2002, embracing higher levels of risk even as the real estate market began to top out in 2005. By mid-2009, Calpers had a one-year loss of 48.8% in its real estate portfolio and was reporting among the lowest returns of any large pension fund in the country. In early 2006, it said it would invest $6 billion in commodities, particularly through index futures, news that caused Grants' Interest Rate Observer to respond: "On the timing of this demarche, we hand Calpers the gold medal for Being Late." Calpers showed even worse timing in the mortgage market. Just before the market tanked, it invested approximately $140 million in unrated collateralized debt obligations (CDOs) and $1.3 billion in complex buckets of loans and debts called structured investment vehicles (SIV). A Calpers lawsuit puts the SIV losses at "perhaps more than $1 billion." If the investment losses weren't enough, questions have also been raised about why certain asset managers were chosen by Calpers during this period. The state brought fraud charges against the pension system's former chief executive, Fred Buenrostro, and a former board member named Alfred Villalobos, who later became a money-manager placement agent trying to steer pension system business. Both men have denied the allegations. Calpers is clearly a better managed pension system these days, and has gained with the market rebound over the last year -- although its $202 billion market capitalization still falls roughly $60 billion short of its 2007 high and the plan remains under-funded by many measures. But Calpers isn't alone in facing funding difficulties. In one influential study last year, researchers Robert Novy-Marx and Joshua Rauh, of the National Bureau of Economic Research, found that pensions are undercapitalized by $3.12 trillion if one assumes the states have to make good on all of their obligations. Faced with such possible shortfalls, some pension funds have begun to swing for the fences again. Last year, North Carolina passed legislation allowing its state pension to invest in assets such as junk bonds, commodities and real estate. Wisconsin recently decided to increase its pension's bond exposure by levering the portfolio, with one proposal to add leverage up to 120% within two years (in theory this could reduce the portfolio's stock risk and slightly increase overall returns, but only if interest rates stay low). The San Diego County Employees Retirement Association -- which lost about $150 million when Amaranth Advisors went bust -- is among other public pensions ramping up similar schemes; it plans to borrow up to 35 percent of its assets and invest the money in treasury futures, and sock other funds in emerging market debt. And a recent review of the Illinois Teachers Retirement System by Alexandra Harris of the Medill Journalism school at Northwestern University found that more than 80% of the system's funds were now seen as risky and that it had added leverage by taking the predominantly risky side of over the counter derivative contracts, such as credit default swaps. Although Calpers has remained active in many potentially risky markets, so far it has refrained from turning to the sort of concentrated bets undertaken in Illinois or Wisconsin. That said, economists say Calpers could still do more to safeguard its assets. Will Calpers follow Wisconsin and other pension funds leveraging up their portfolios? In a world where pension funds will be lucky to obtain 5% annual return, there is simply no way they will attain that magic 8% investment return without taking on more risk. But one thing 2008 taught pension fund managers was that asset class correlations are notoriously unstable, especially in a liquidity crisis, and that you have to have safety measures in place to protect against downside risk. First and foremost, pension funds need to do a better job at managing their liquidity risk. In fact, I think 2008 was a watershed year because people will look back and say that was the year where illiquid, complex, structured strategies died and liquid, easier to understand strategies took off. But be careful with liquid leveraged strategies. I know the smart folks at Bridgewater know what they're doing, and that a lot of the thought process comes from their work on engineering targeted returns and risk, but I get very nervous when the pension herd moves into replicating a strategy/process without thinking of the consequences of their collective actions, adding more leverage to the entire financial system (bond bubbles can go on longer than you think!). Large pension funds like Calpers, CalSTRS, the Caisse and CPPIB need to rethink their entire approach to mitigating downside risk. The focus should primarily be on strategic asset allocation, with enough wiggle room to make opportunistic tactical decisions when markets shift abruptly. Hedge funds taking directional bets on markets will be among the best performers in 2010 as concerns over the health of major economies continue to dominate markets, said Lombard Odier's head of hedge funds advisory. global macro to prosper into 2011 despite a disappointing May. "The overall environment has been driven by macro events in 2010, and I believe it will continue to be the case because of economic imbalances in the largest markets," said Kohler, whose team at the Geneva-based private bank oversees a fund of hedge funds and advises clients on hedge fund investments. With markets highly volatile, he said macro managers benefited from their ability to take long or short positions in most markets, trade in very liquid products and change positioning nimbly if their view of the economic outlook changes. "That's not the same for all asset classes; there has been a significant drop in liquidity in areas like credit, making it difficult to turn around portfolios when the market moves against you," he said. CS/Tremont data show global macro strategies lost 0.63 percent in May, which Kohler said was disappointing, because such strategies should have performed well in a month when pressure on euro zone economies triggered heavy market declines and sent the euro into tailspin. "The losses were caused because people were worrying about liquidity and simplifying their trades, with many ending up in the same trade for different reasons," he said. For example, he said, managers who had been short the euro and long the Australian dollar switched into a euro-dollar trade, which they thought mirrored their original trade and offered better liquidity, while managers playing the Greece theme avoided credit default swaps on worries about a regulatory ban, and used euro-dollar trade as a proxy. "So people were using same instruments for different reasons, exacerbating volatility in those instruments." While Kohler said funds of hedge funds should thrive after a difficult two years, he expected their numbers to fall. "There's going to be industry consolidation. Those funds of funds which are too small or do not have a clear strategy will either close or be bought," said Kohler. "But prices won't be high. People won't be buying their strategy or their distribution, just their assets under management," he said. Kohler is too nice. I think the majority of funds of hedge funds will shut down their operations in the next three years. In a deflationary world, fees matter even more, and they'd better be really good at picking alpha managers if they're going to be charging 1 & 10 on top of the 2 & 20. Even if they are good at picking winners, most investors will balk at paying an extra layer of fees. And this last interview with Bill Fleckenstein, which I am able to embed here, is for all you perma-bears who think we're heading into another depression. You'll enjoy it, but I don't subscribe to his gloomy scenario. To be fair to Bill, I agree with some things he says on how the stock market lost its discounting mechanism. He rightly blames this on speculative momentum type traders and computer powered quant traders who have developed algorithms to exploit market inefficiencies. I call this "algos running amok". It works fine when things are fairly stable, but when volatility spikes, watch out below!